Hello from the other side! Back in December I was super excited to have my gathered dart tutorial featured in Love Sewing Magazine. Hopefully you're already familiar with Love Sewing. If not, let me introduce you to its delightful editor Amy Thomas (aka Almond Rock) who, since taking the reins at the magazine ten months ago, has helped "stitch in" some inspring new features and created new connections with the sewing community. "I'm still getting used to what might be a ‘typical’ day! Since taking the job of Editor of Love Sewing Magazine ten months ago, my life’s been pretty hectic. It generally starts out the same – either my alarm buzzes at 06:30 or my cat slaps me in the face with her paw demanding breakfast. I have a massive cup of tea and pick out one of my handmade dresses to wear. Even though in my 30s I can't resist a whimsical print! Then I’m off on my way to the train station, it takes me two hours to get to Stockport in Manchester, where the Love Sewing offices are based. Once actually in work, the very first thing I do is check my emails. It could be reading updates about ongoing projects for the magazine or gathering bits of stitchy news about new patterns, fabrics or classes but I always have a full inbox. The maddest day of the month is PDF day, when the magazine gets sent to the printers. My art editor and I will be found scouring every page to make sure there are no mistakes, all pictures are perfect, and the copy’s right. This is especially tricky when dealing with sewing instructions and you can’t follow them for real! We need all the illustrations, photos and step-by-steps to be in the right order and all the pattern pieces to be labelled correctly. On non-PDF days, the focus is planning for the coming issues and commissioning out all the copy. I work several months in advance to make sure everyone has enough lead time to get their projects completed. I’m also working with Claire the pattern designer at Simple Sew on selecting designs to be included as gifts on forthcoming months. So right now I’m planning copy for May to July and Simple Sew patterns for August to October! I have 100 pages each issue which need to contain news, book reviews, lots of competitions, expert advice and most importantly including as many dressmaking, home and accessories projects as possible. Lots of plates in the air! Once a month I get to head out of the office with my art editor and spend a day shooting the cover garments as well as different dressmaking or accessories projects we’re including in the next issue. It’s so surreal after years of arranging photography for my blog to see a professional make-up artist and photographer at work. I’m on hand for styling and fitting clothes on the models and approving the shots. Plus there’s an amazing butty shop round the corner to keep us all focused. And let’s not forget the writing! As a girl I did always hope to be a published crime novelist but in retrospect this is better: I love to do as much writing as I can for Love Sewing, whether it’s interviewing amazingly crafty people, putting together exciting news pages or just writing the contents list! My happiest day was writing that first welcome letter. When my working day is done around 17:30, I head off to Stockport train station and start the long journey home. I’m lucky because my partner is a great cook often has some delicious vegetarian food waiting for me. Plus he never minds if I run straight up to my sewing room for an hour or two of my own projects. Then we head to bed, ready to repeat it all again the next day! I may always be tired and I may always be rushing around like a crazy person but I can honestly say I have a job that I love." You've been editor of Love Sewing magazine for about ten months now. What have you enjoyed the most about your role? "The role is pretty demanding but every now and then when I'm head down frantically checking proofs I stop for a second and think how wonderful my job is. The other thing that amazes me are the incredible statistics! I always knew the sewing community was big but to think there could be 30,000 people sat thinking about sewing a project from the magazine is very humbling." What is your proudest achievement, or favourite piece, so far? "Every issue becomes my new favourite. I'm pretty pleased with issue 24, on sale now, because it has great techniques, oodles of inspiration. It feels like the mag has fully grown up!" What happens in a typical or favourite day? "We're on a four-week schedule per issue. Two weeks of writing, editing and photography and two weeks of laying out and proofing pages. In addition to this I'm commissioning projects and articles roughly 3 months ahead and selecting pattern free gifts 6 months ahead of time. For each issue I create a flat plan which spells out what will appear on every page and this is circulated around the team so everyone can stay on top of the progress of the pages. My current favourite feature is the Brief History Of...where we get to delve a little deeper into fashion trends, historic companies and the sewing world." How do you come up with story and special feature ideas? "As I hope everyone kows, I love sewing blogs. I also follow lots of Pinterest boards and fashion companies. Plus I read a lot of other magazines. Every month I spend a good amount of quiet time thinking about what everyone might want to sew, or what I'd want to learn and where possible think what might be of interest to people a few months down the line. I also love it when people bring great ideas to me! That makes things a little easier." For those sewers who haven't got their hands on Love Sewing, what can they hope to find? 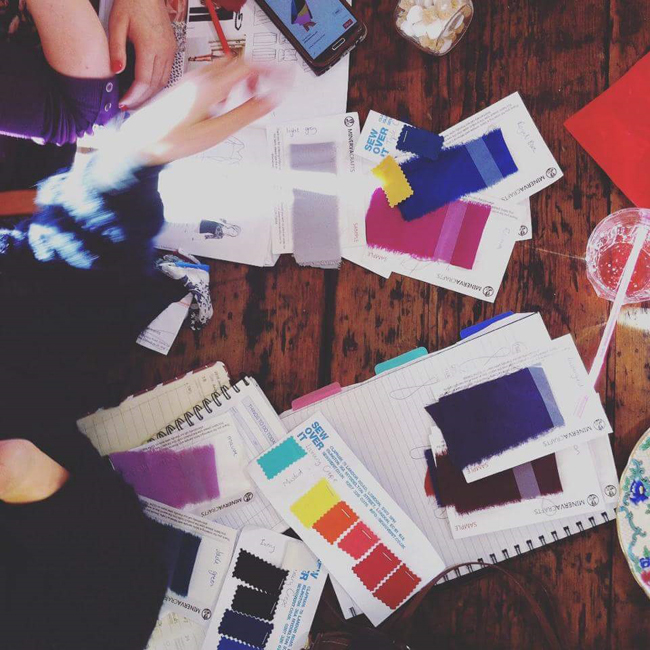 "We're a healthy split of fun news stories, articles, inspiration and advice, plus dressmaking, accessories, homeware and children's projects. We fit lots of patterns into the magazine and the template sheets plus there are pdf downloads if you misplace your copy or aren't into tracing! 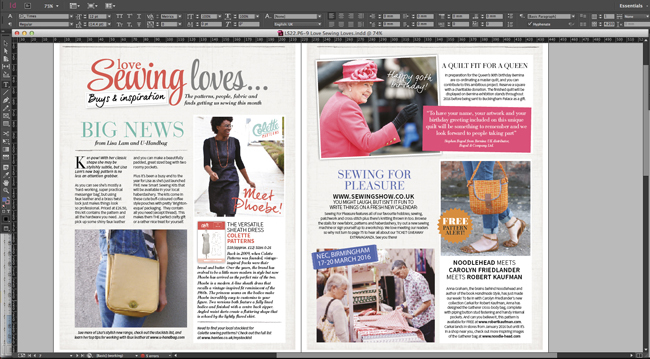 We have great columns from Wendy Ward of MIY Workshop, Elisalex de Castro Peake of By Hand London, Alison Smith, awarded MBE for her services to sewing and the Great British Sewing Bee's Claire-Louise Hardie, aka the Thrifty Stitcher." What's your strategy for finding time to sew in between editing, blogging and commuting? "I sew in every spare minute I can find! 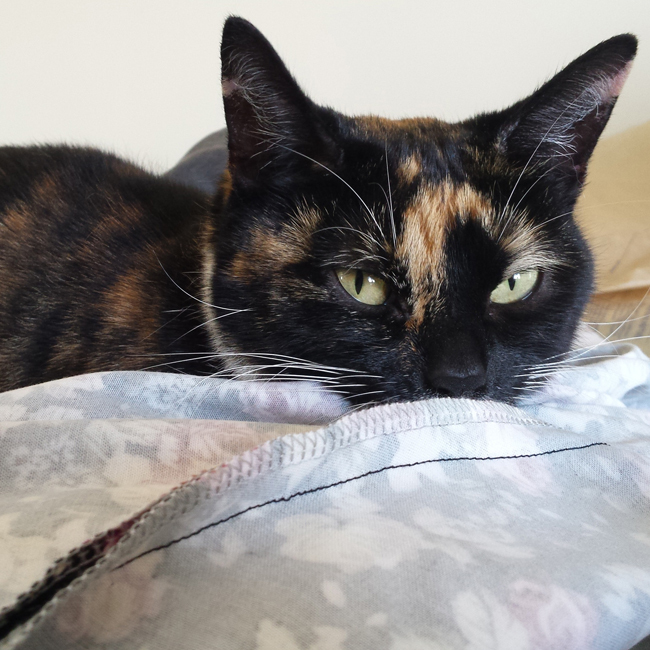 I have a very forgiving partner so I can sneak off for some selfish sewing time whenever I need. Plus you need to be realistic about what you can achieve in the time you have spare otherwise sewing will become a disappointment when you fail to hit unfair timelines." "I'm a vintage lover but not a full on vintage reproduction wearer. I like patterns that nod to the past but still look in place today. Plus as it is probably cclear I gravitate to bright colours and prints because clothing needs to make me happy. 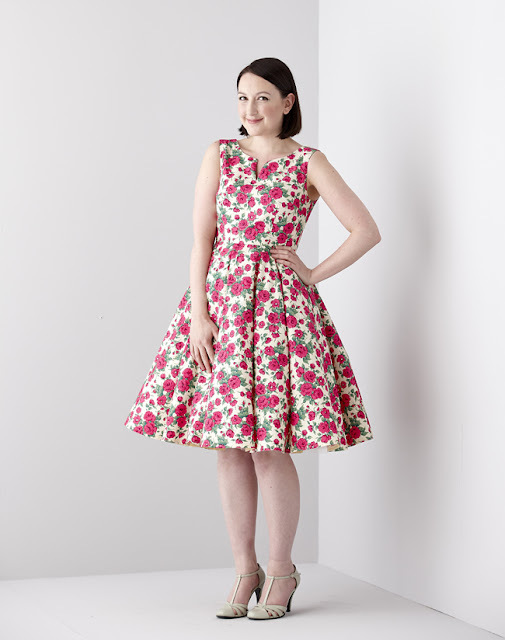 I keep an eye on the high street - Boden and Joules, Modcloth in the US - but really it's the sewing community that gets me excited about new projects and styles. They make me push myself out of my comfort zone!" 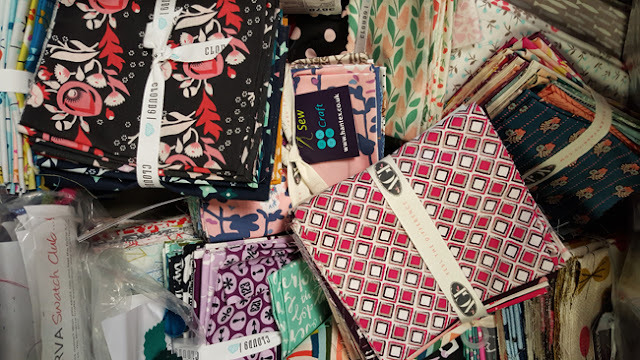 What's on your sewing list? 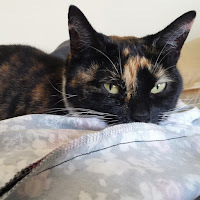 "I'm currently sewing lots of nice easy to sew tops to go with jeans during this grumpy weather, and a couple of dresses from vintage patterns with cute features. I also owe my partner a shirt so I'm chipping away at that a little bit at a time. I just finished V9127 which was a mammoth effort, taking about 7 weeks to get all those fine details just right." What are your 2016 sewing trend forecasts? "It's so hard to tell what might be the next big thing but fashion wise it seems ruffles are coming back in a big way and garments with multiple layers of transparency, so maybe chiffon will be the fabric of the year for everyone to tackle. Vintage inspired sewing seems to be gathering an immense amount of support so I'm sure that will be continue to grow. 'Granny chic' or 'French 'Country or whatever you want to call it seems likely to be a strong part of next year too. We'll be making roll neck jumpers and pinafore dresses, layering up our clothes adn pulling on ankle socks in no time. Trousers seem to be getting wider again so let's see if more bootcut and flare patterns start to crop up!" Thank you Amy! I especially like Amy's point about being realistic in what you can achieve with sewing. With work and family I find that fitting sewing into my life is such an ebb and flow process for me and, after a bit of a sewing break over the new year, I've got some new projects I can't wait to share on the blog soon. In the meantime, you can catch me and Love Sewing over on Instagram, too! Until then, happy Sunday and happy sewing!